Hello and welcome to The Twinery and Imaginisce Blog Hop!! If you have stopped by on the way from the Imaginisce Blog you are on the right path. If you have just landed here and would like to hop along with us today, hop on over and start at The Twinery Blog. 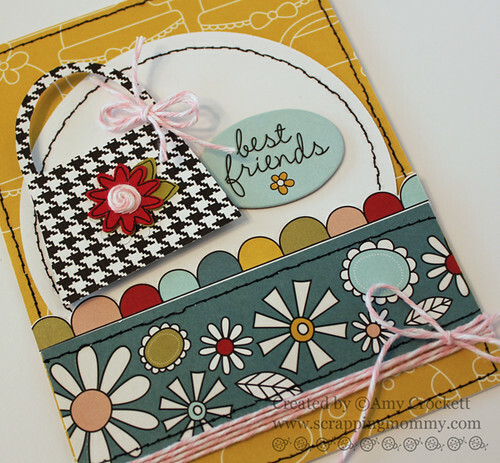 Today I have a fun card and matching purse gift bag to share with you. I received these fun papers called Sole Sisters from Imaginisce to work with and I added some yummy Blossom bakers twine from The Twinery. I cut the purse image with my Cricut and the Forever Young cartridge. I tied some of the beautiful Blossom bakers twine from The Twinery on the purse handle as well as the flower center. I finished it off with some more of the blossom bakers twine. The purse bag is also cut on my Cricut and the Forever Young cartridge. I decorated it just like the purse on the card. So, hop on over The Twinery blog for all the details and don't forget to leave your comment below for a chance to win and then hop on over to Shellye McDaniel's blog for to see what she has created and more chances to win. This set is so cute!! I love the use of twine on it....anything with twine always looks so cute! Cute! Love the little bows on the projects with the twine. Love the purse card. Great idea. Love th twing giveaway. Sure would love to win this because I would put twing on my cards. Thanks for a chance to win. These are so fun! Perfect for the Sole Sisters Collection! These are adorable! Now I don't have that cartridge but I'm seriously considering it! I just love the purse card, it would be perfect for my friend's birthday. Could you tell me what size the purse on the card is? I love the twine circle for the flower center! Fabulous! This project is just adorable. The twine just adds that little bit needed. Thank you for sharing. 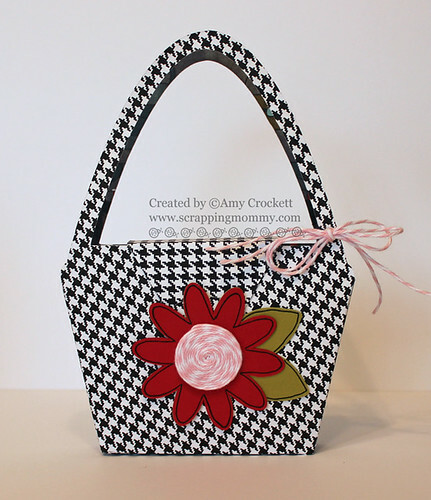 The houndstooth pattern is perfect for your purses and all that color is fabulous. What a Great Purse gift bag. cool pattern paper. Love the Twine Flower Center Awesome Idea. thanks for sharing and for the chance to win. Sweet purse! Love houndstooth prints! Awesome projects and I love that paper! Love all the projects today. The twine is a great accent. How cute! Love the houndstooth and the purse bag is fab! I came here to see your creation for MCT BUT had to post that this purse is adorable. What a great little ensemble. LOVING that purse! Love how the twine makes everything so cute! 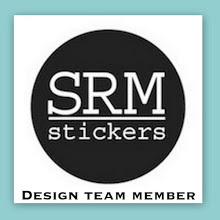 Thanks for sharing your projects - very cute. Perfect paper choice for the purse and the twine just sets it off, fabulous job!! Love the purse card, REALLY loved the shoe card! Thanks. Really nice use of the Sole Sisters collection! Love that houndstooth paper! Cute job on the ensamble. Ahhhh, what BFF wouldn't love to receive that!!! You did an amazing job. Loved how you used the twine to jazz it up! TFS! Love the card...I need that color twine!!! The purse is adorable. I love the flower centers made of twine. love the purse! hopping along on day 2! Great ideas!!! Thanks for the inspiration! Very cute projects! 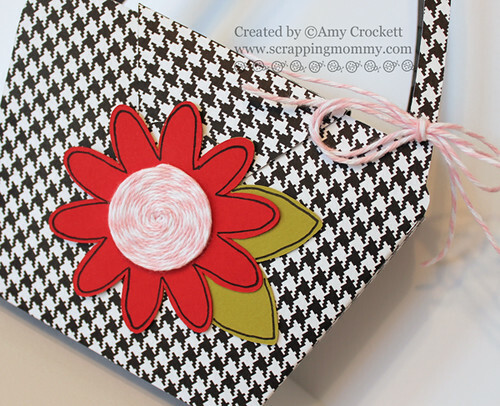 I love that purse out of the houndstooth paper...super cute! Love your adorable project. The matching purse is fabulous! Cute duo for day two. Love your projects. What an ispiration. I love the handbag with the twine. Absolutely beautiful!!! Your pocket books are simply divine!! Wow just gorgeous! I love it! Great projects with Sole Sisters, the twine compliments the collection perfectly! Very cute card and love the purse! What an awesome gift bag. Love it and the card that goes with it. 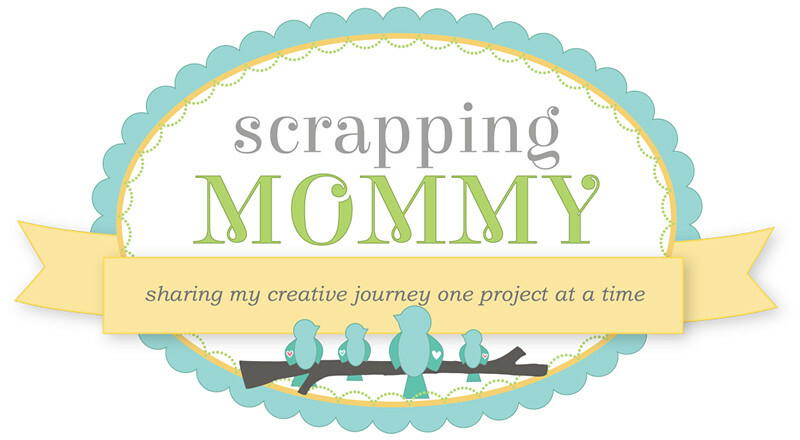 Super projects full of fun ideas using adorable papers from Imaginisce and The Twinery twine! I love how you used the twine! So cute! I love how your purse matches the purse on the card. Wow love your projects and the flower with the rolled twine is so creative, love it. Very pretty! I love the purse! 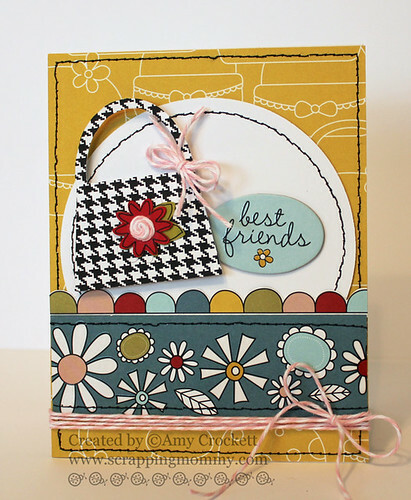 THAt best friend card is so cute and colorful, love that little purse. lOVE YOUR IDEAS. OMG, your purse set is so super fun and sassy.. 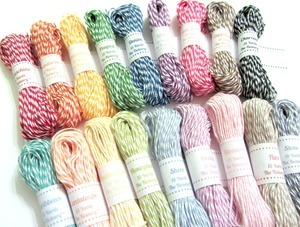 I just love it..
i love your twine...i can think of numerous ways to use them! Like flowers themselves. But love how you made the centers with them. I love the matching purses! Very cool! Love them both and the terrific way you incorporated the Twinery Twine!! Also love the Sole Sisters paper!! Great Job!!! Love what you did with the purse and its flower center it looks great!!! Great job. Love how you made the flower centers. Thanks for the great ideas and tips. I adore this little set! Great job!! Love, love, love your purse bag! So cute! OMgosh...by far my absolute favorite!! Just adorable!! These projects are awesome! I have twine fever and the only cure is more twine! Love all the pretty colors! Thanks for the chance to win. The little purse is too cute for words! I love it so much! I like what you did with the flower. Thanks for sharing! Great card. Love the papers you chose. 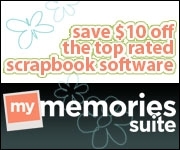 Your use of twine is enlightening.I'd love to win some to try. Adorable card. Love the cute lil purse. Wonderfully done. Very sweet - thanks for sharing a great idea!! Love the colors of those twines! Thanks for sharing your wonderful project! Oh my! This set is ADORABLE!!! I can't wait to scrap lift this. Thanks for the inspiration! Cute projects - I really like the purse bag with the big flower! I have seen more and more people rolling the twine of balling it up in the center of flowers - and I love it! Absolutely adorable set! It is just stunning! TFS and for being part of this Twinery/imaginice fun hop. so cute , love the embellishments. Love that huge, pink, flower center! It was such a great color choice! Great projects, thanks for sharing!! Your card is just TOOOO adorable with the cute purse on it! 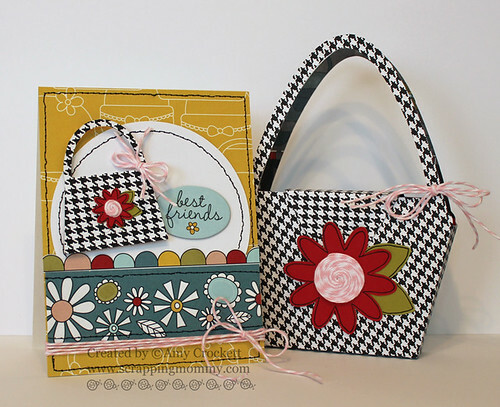 Your houndstooth purse and matching card are adorable. Thanks for sharing another use for twine and a great paper collection!